Warning Signs Stickers. You come across them everyday, many organisations, businesses, professionals need them to get their message across and keep things running smoothly. Whether they’re to be used in schools, shops, medical centres, parking bays, around the home or for commercial properties they’re more useful than you may have first conceived. 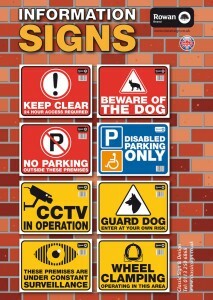 Our warning signs not only convey a strong clear message, but they look great graphically too! To put your mind at rest that you will be purchasing the very best stickers available we’d like to let you know a few things. First, our stickers are waterproof and weather proof, which means they will last a long time saving you money! Second, like our other products they’re self-adhesive and can be used easily on clean dry surfaces. Last but not least you can be confident that you’re receiving 100% British manufactured quality. So whether you need warning stickers to let people know you have a dog, or you don’t want others to park on your driveway there are solutions for you! The same if you own a commercial building with private premises, it’s your responsibility to control the area, which is where our wheel clamping, disabled parking only, keep clear, no parking and surveillance warning signs stickers come in handy. Please take a look at our products and take advantage of our world wide posting, free UK delivery and discounts today!